Pre-heat oven to 205°C / 400°F. Line cookie pan with parchment paper. In a sauce pan, combine water, butter, and salt. Heat to boiling. As soon as it boils, add all the flour (don’t let it sit boiling away or it will start evaporating). Stir vigorously until dough forms a ball, and remove from heat. Let mixture stand on counter for 10 minutes. Then beat in eggs, one at a time. Drop 12 heaping spoonfuls of dough onto cookie sheet. Bake 30 minutes and tops should be golden brown. Remove from heat and transfer pastry to wire rack. Cool at least 40 min. In chilled bowl with beaters on Medium; beat heavy cream, icing sugar, and vanilla until soft peaks form. If the berries are tart sprinkle sugar onto them and toss. Once pastry is cooled, use sharp knife to cut a seam near bottom of pastry, and if you look inside you’ll see it’s fairly hollow. 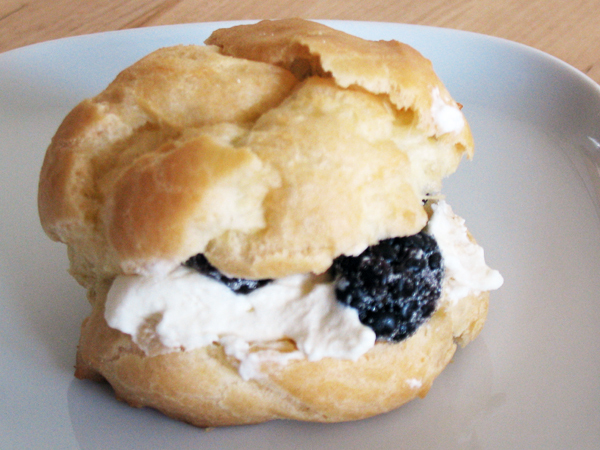 Stuff puffs with berries and cream as you want to eat them, don’t pre-stuff or they get soggy.